Every year, we field calls and emails from customers eager to know the best value gift for toy soldiers. Our answer is: playsets! Purchase a plastic toy soldier playset and you provide a chance for a kid or adult enthusiast to set up and/or play a battle. Both sides in an engagement are represented, often with accessories like buildings or artillery to anchor the fun. The playsets are discounted heavily, and we ship them for free! View all our 131 playset on our website. Back in the 1950-70s, the Sears Wish Book contained a range of playsets from Marx Toys. Many remember those pages fondly – and remember the excitement of finding a playset under the Christmas tree. Marx is no longer in business, but we carry recasts of their figures as well as models from many other manufacturers. Inspired by Marx, we’ve produced a huge variety of our own playsets for over thirty years. We offer painted versions of playsets in addition to unpainted ones. They don’t cost $7.95 as they did in the 1950’s, but our playsets offer great value. View all our 131 playset on our website. To many people, the phrase ‘toy soldiers’ conjures up an image of the Changing of the Guard at London’s Buckingham Palace. Clad in dress uniforms, these soldiers are viewed by millions of tourists every year. Our ceremonial toy soldiers are cast in metal and painted in authentic uniforms. In scale they are 54mm, or about 2 1/4 inches tall. W. Britains has produced these figures since their earliest days, and we offer a huge variety of their ceremonial figures. View all these sets as well as our entire range of W. Britains toy soldiers on our website here. Following through on New Year’s Resolution # 1 (expand our website listings for our extensive collection of Starlux Napoleonic figures), we bumped into this 2010 French news piece about a passionate Starlux collector. Warning: it’s in French, and you have to view one minute of French commericals to get to the video. Enjoy! A year ago a new manufacturer, Expeditionary Force of Singapore, entered the 54mm plastic market with a range of American Civil War figures, and announced that their next release would be Ancient Greeks. Since the ancient world is under-represented in 54mm plastic production, this was exciting news. 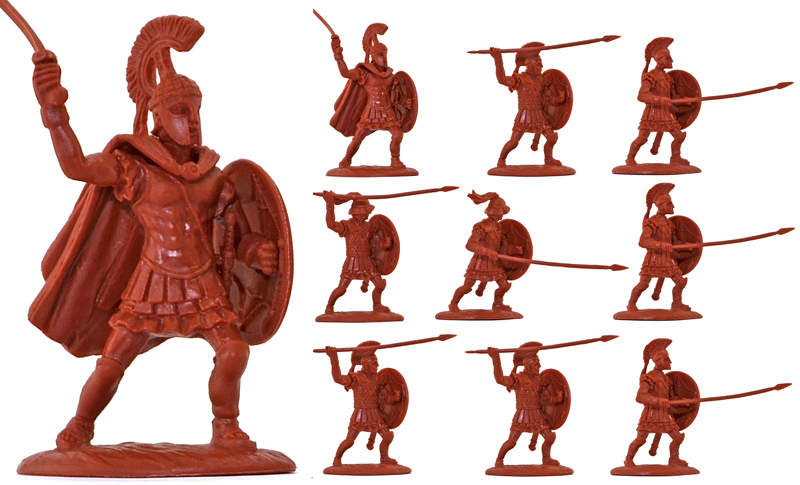 Now Expeditionary Force’s new range of 54mm Greek Hoplites, light troops and cavalry has arrived, and the news is good. I’d say the only figures in this scale which stand up for comparison are the painted models from Forces of Valor’s Historical Legends and Play Along’s Lord of the Rings figures. After assembling the range for the photos shown here and on our website, I’ve put together this post to share my assembly tips. Don’t open these boxes expecting a single-cast figure: each Greek comes unassembled, and includes a selection of pieces which can be snapped together in a variety of pose options. Some of the snap-together joins are not secure, however, so I suggest permanent bonding with glue. The manufacturer recommends using a cyanoacrylic, such as Gorilla Glue. Check the label carefully, as there are several types of Gorilla products. Lay out all the parts on a tray in front of you. Choose which elements are to make up each model and set the extra pieces aside. Prepare the weapons, if they are not straight, swirl them in very hot water – this will help the plastic straighten out. Begin by gluing all left arms onto shields and set aside to dry (10 minutes is suggested by the manufacturer). Glue all left arms into left shoulders. If a weapon is to be held by the left hand, you can put it in before gluing. This will be a snug fit and no gluing will be necessary. Glue all right arms into right shoulders. Follow advice on weaponry. The peltasts, for example, might hold extra spears. Glue sword scabbards in place. There may be some question of doing this after the left arm with shield goes in, so examine your options before following these directions to the letter. The cape must go on after the scabbard, however. If the figure has a cape, apply a little glue below the neck of the figure and then slip the cape over the figure’s head so it rests in place, touching the glue. I would not suggest using glue on the head to hold the cape in place. The head of the figure goes on last. There are several types of heads available. If purchasing multiple sets you may want to trade heads between sets to give a uniform look to specific units. Unlike arms, which are meant for unique body trunk types, all heads go with all figures, so you can switch at will. Heads do not have to be glued in place, as the fit onto the neck is snug. I suggest it only because they will not ever come off, so you won’t lose any when playing. Assembling horses is very easy. Insert foot plugs into bases. Turn horses upside-down and put a tiny bit of glue into the slot to affix the plugs in place. I have not glued my mounted figures onto their horses, but this is an easy step if you wish to do it. Put a dab of glue on the rider’s bottom and place on the horse’s back. The range includes six different sets, each available in red or in linen/cream color. There are two light infantry sets, two heavy infantry sets, and two cavalry sets. You can view the entire Expeditionary Force catalog on our website. We are including these assembly instructions with each order purchased through our website. Jamie shot a video after photographing the 2013 Super-Deluxe D-Day Playset. You can view the full gallery of images from the playset shoot on our website here. 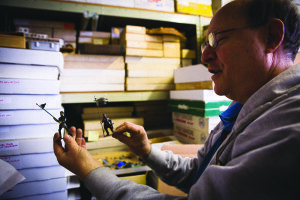 Director Ani Simon-Kennedy and cinematographer Cailin Yatsko at http://www.bicephalypictures.com/ produced this nice piece about Jamie and The Toy Soldier Company in their web series ‘W?RK,’ focused on New Yorkers who turn their hobby into their profession.